I’m not depressed. I’m not lonely. I run about 30 miles a week. And, surprise–I am a binge-watcher! This post is starting to feel a bit like an “I’m a Mormon” commercial parody, so let me back up a bit. My research analyzes over 500 typed pages of discourse from interviews, focus groups, journals, and surveys of media marathoners, and concludes that media marathoning is, on the contrary, a social behavior. I defend media marathoning in my book and have used this blog to describe some of the positives of the practice. This previous post focuses on marathoning’s benefits for the mind, body, and soul. Let me now focus on the social. Here is how I sum up the findings about media marathoning and socializing: “There was a clear community quality to marathoning, with many marathoners watching television or films together, and some even reading books together [….] 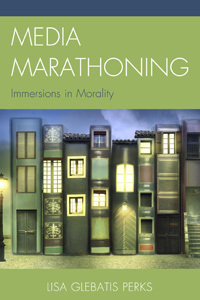 [C]onversations about the story were an essential social aspect of marathoning” (30). Think about what happens to you during a condensed, intense viewing experience: you may find yourself thinking about the story and feeling the emotions it created for a long time after you turn it off. Often, we need to outwardly express those inner thoughts and feelings. Here are some of the many ways my media marathoning study participants enhanced their media experiences through communication with others. Rituals and Gatherings. Catherine* attended “L Word parties” as she was going through the difficult process of coming out. She and fellow fans would talk about characters “like they’re our friends” (33). Communing Asynchronously. Natalie took TV recommendations from a friend in a different city. After Natalie finished a season of a recommended story, she would call her friend and start the conversation saying, “I can’t believe it ended like this!” (34). Computer-Mediated Communing. Lotti turned to unknown others for communication about a beloved story: “There is no one better to talk to about Doctor Who than other Whovians, and no place better to find Whovians than on the internet. I feel a sense of fulfillment when I branch out and connect with these fans that enjoy what I enjoy” (34). Lotti’s experience encourages us to see human connections not in terms of surrounding oneself with people, but in terms of reaching out to others through a variety of means to have fulfilling conversations. Fan Pilgrimages. Some marathoners cemented social bonds by visiting fan sites together. Sondra, for example, traveled to the Wizarding World of Harry Potter for her birthday celebration and met up with a friend to tour a museum exhibit of Harry Potter props (35). These pilgrimages can facilitate in-the-moment conversations between friends or family and create a shared embodied experience to reference in upcoming conversations. I’ve read about media marathoning being linked with negative health effects. Too often, what we’re really seeing is the negative health effects of sitting for long stretches of time, not specifically media marathoning. Sitting too much–while watching TV, working, reading, knitting, or any other activity–isn’t good. (Have no fear! I am writing this post while doing tree pose next to my standing desk.) Aristotle advocated for moderation, and it’s a virtue we would all do well to abide by. Remember that a life of moderation can also include media marathoning from time to time. I appreciate Danger Guerrero’s balanced conclusion in UPROXX: “It’s not so much that binge-watching is bad as it is that depression is bad and a sedentary lifestyle filled with solitary, convenient time-wasters could be a symptom.” Too bad the article title is “Maybe You Binge-Watch Television Because You’re Super Depressed,” and it’s accompanied by a sad-looking schlub, remote in hand, sitting alone on a couch. However you choose to think about or report on media marathoning or binge-watching, please consider other images, other discourses, other messages. 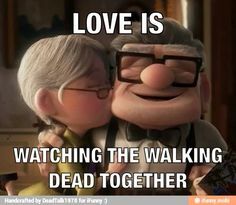 Consider, instead, how relationships can be strengthened through the shared enjoyment of a show. *All study participants have been assigned pseudonyms.